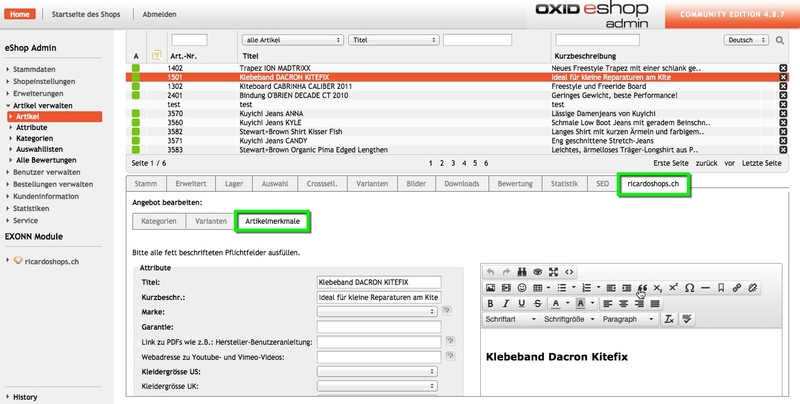 OXID eXchange | ricardoshops.ch Modul 1.1.4 | Stable | CE | 4.7.x - 4.9.x | Module, Themes, Language Packs direkt herunterladen! No more complicated product data upload via XML files. The module connects your existing oxide shop system with ricardoshops.ch via full integration interface. 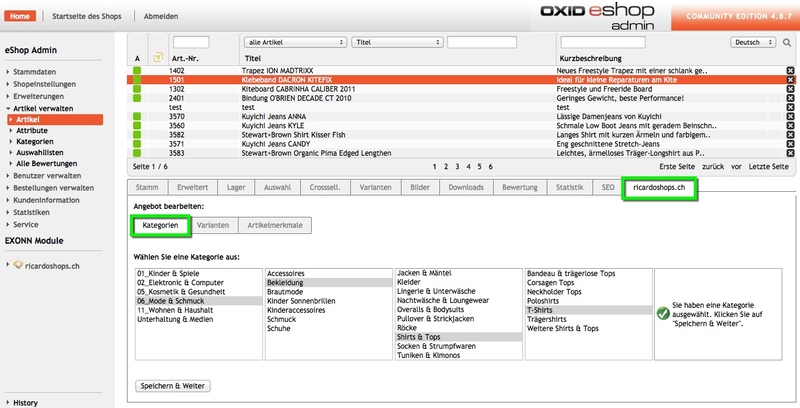 The features of this expansion include the products export from the shop to ricardoshops.ch and all the article master data such as photos, descriptions, prices, products features and other important product data. Of course, the transmission of the current inventory and update them as soon as, for example, a new order of another sales channel for you by then.With changes of product data in the admin area, such as description, prices or product pictures, they will automatically be forwarded to ricardoshops.ch.Orders of ricardoshops.ch be automatically imported directly into the administration area Oxidshopsystems so you centrally manage them there, and execute for example invoice with our accounting module and, if applicable. also can credit back.If you goods by what reason it can not even deliver to your customer forever, the affected order can be easily reversed in the admin area. Should a delay deliveries, relevant information can also be shipped directly from the admin area out to their customers.